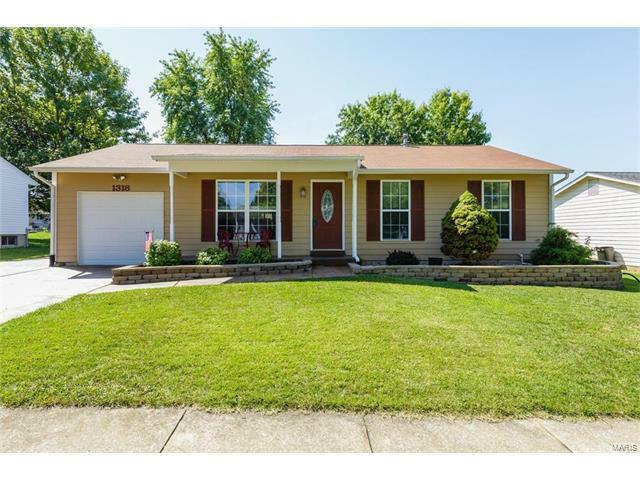 Charming, 3 bedroom, 1 bath ranch with a full basement (partially finished) in a fantastic O’Fallon location! This home offers excellent curb appeal with a one car garage (23 foot deep), leaded glass front door, a well-manicured lawn, professional landscaping, a 15 x 15 deck and a level, fenced back yard. Features include wood laminate flooring throughout the Living Room-Kitchen-hallway, vaulted ceilings in the Living Room and Kitchen, white six panel doors, white cabinets, backsplash, smooth top stove, microwave, dishwasher, ceiling fans, walk in closet in the Master Bedroom, ceramic tile floor in the bathroom, a security system, garage door opener and a partially finished lower level for a total 1,113 sq ft of finished living space. Located just minutes from the shopping, restaurants, recreation and services on Hwy K, Winghaven and Bryan Road. In addition, there is easy access to Highways 364, 40 and I-70. Desirable schools, great home, amazing location…this home will not last! Bryan Road to Great Warrior Drive to Right on White Hawk Drive to Left on Trading Post Lane.